Rafael Soriano getting hit by a Vladimir Guerrero line drive (and Vlad hit everything harder than anyone) was the worst I ever saw. I remember when Huff got hit. And Blackburn of the Twins in 2008, hit by Bobby Abreu. I’m trying to remember how many times a helmet would have helped. 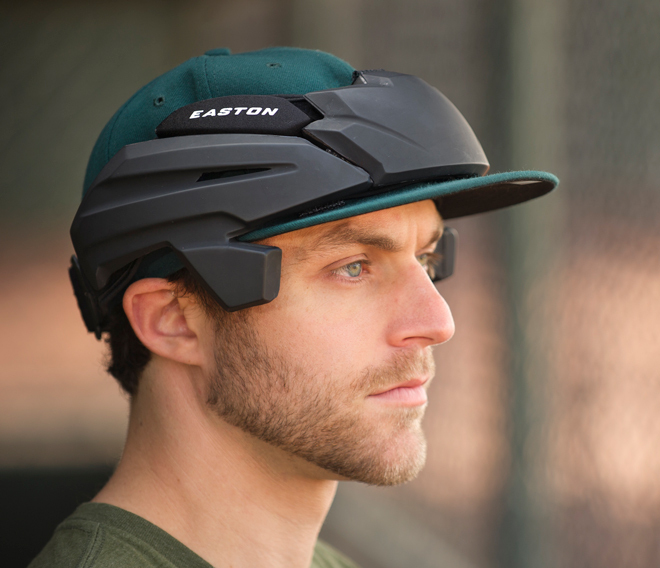 I guess it’s the same with base coaches and hitters– they could get hit in the face or neck but at least the helmet protects most of the head. But then there’s Doug Fister in the World Series and Javy Guerra last year with the Dodgers– take one off the jaw or temple and keep on pitching. To give them the protection they need, instead of King Felix it would have to be King Arthur and his knights, as in helmets with visors with only the eyes peeping through. There are plenty of photos of Roberto Clemente wearing his. Didn’t Yaz wear one in the field as well? At any rate, when we were kids we thought it was a cool look. We wore our souvenir helmets when we played. 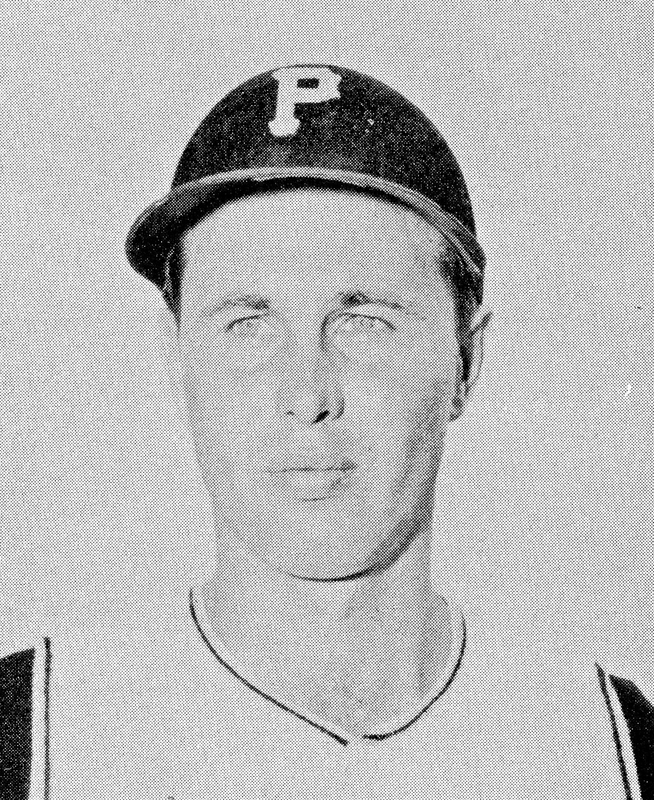 I know he wasn’t a pitcher, but I see someone hit in the head & think of Tony C.
Peg, I think History was talking to dash dash virgule virgule below. I recall Tony C. as well! Make that ABOVE! Geez! This is dizzying! This was a horrible sight to see. I just hope there are no ramifications for J. A. Happ but seeing blood come out of his ear there can only be some serious damage done that may not show for a while. This said; something has to be done to protect a pitcher from getting crowned from a ball traveling at 120 mph back at him. His reflexes are not that swift to avoid injury. Most sports have helmet requirements where injuries abound. It is for the players’ health. Even bicycle riders have to wear helmets. Let’s hope the powers that be come to that realization and not let this continue for long. Baseball cannot afford to lose talent that easily. Great historical and informative article as only you know how to write. Mary I am a neurologist. Yes. Clear or bloody fluid coming out of the ear may indeed indicate a skull fracture which then allows cerebrospinal fluid to leak through the ear canal. So you worry about imminent death from an arterial bleed-epidural hematoma OR a venous leak-subdural hematoma. It appears that neither bleed occurred as it would have shown up on an MRI. HOWEVER, the majority of times we see “blood” from ear it is a laceration of the ear itself or a small bleed from the scalp that dribbles down across the ear. Part of Buster Onley’s podcast was about this subject. You should listen. I’m glad to hear that J.A. Happ is OK. All indications point to it being prudent for these guys to wear helmets to avoid injury. A few months ago, Hillary Clinton fainted and hit her head, ending up with a concussion and blood clot in her skull. The blood clot could have been life-threatening had she not received timely treatment. Add a projectile coming at the pitcher’s head (or thereabouts) going a 120 mph, and it’s not hard to imagine someone either suffering serious injury or even death. I imagine Happ’s medical team will be monitoring him for any untoward developments from this incident. This baseball helmet debate sounds a bit like the motorcycle helmet debate. Some riders want the freedom to choose whether they wear a “brain bucket” or not. I think the stakes are too high NOT to wear a helmet in both cases, but the right to choose is more important than safety for some folks. The only requirement for a man to be manly is sensitivity. That makes helmets a great idea! Smart men are also aware. They’re still riding in the back of pick-up trucks here in Louisiana. I have a feeling that the Rockies-Yankees game would come in handy to use these helmets. Nicasio has yet to lose a game, and because many New Yorkers are kind of rude (no offense, I ❤ NY) a batter might have a nasty bunt that will clock Nicasio in the head. Though I do think the Rockies have a chance, with Helton hitting .319 with 6 RBIs. Plus, I am sure that the Rockies are going to do well even without Tulowitski, whereas the way the Yankees are acting with the shortstop out they will not do as well. And you knew it was going to come back to the Rockies anyway, guys. The Vin–Keith Olbermann’s favorite baseball announcer and mine (and by the way, haters, Mr. Scully is conservative–all we care about here is baseball, so please go away)–has gone on for years about the need for more than just the batters to wear helmets. After the death of a minor league coach a few years back, MLB required coaches to wear helmets and I remember larry bowa (I have never thought, knowing what an unpleasant person he is, that his name should be capitalized) was coaching third for the Dodgers and said he wouldn’t–but he did. Helmets all around, please. Nice shot of Fred there. 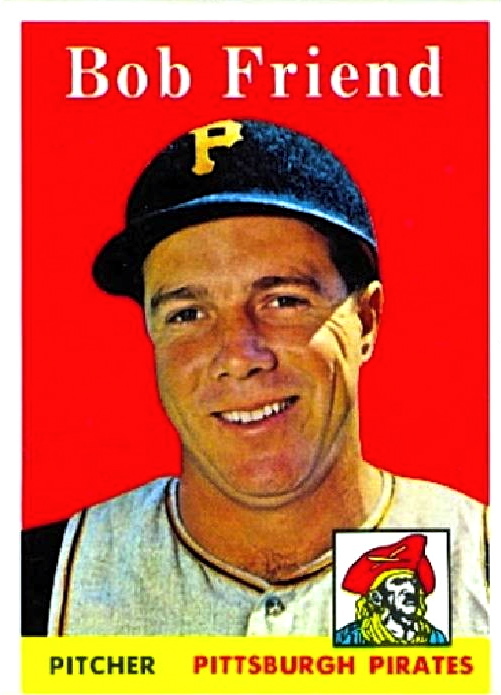 The Topps guys got him in about the same spot where they shot Juan Pizarro for his gorgeous card in the ’57 set. I’ll post on my blog later. You may well be right, Keith. With today’s technological improvements, helmets for pitchers could probably be made much lighter than the “miner’s hats” of the old days. But it is very, very difficult to change a culture, and if anything the fact that so many people don’t even know or remember Branch Rickey’s efforts to helmet his pitchers proves it. The same could be said of cheerleading, at least the seriously competitive kind. Time was when cheerleaders just danced, waved their arms, jumped, and did the splits at the sidelines. Now they form teams and perform incredibly dangerous stunts in which young people tumble and get tossed everywhere. Serious head injuries and even deaths have resulted when accidents happen. But will cheerleading ever adopt helmets? Doubtful. When you consider how difficult it is to even get some motorcyclists and bicyclists to accept helmets–how some of them regard it as an imposition on their liberties–you understand how difficult it’s ever going to be to get baseball to accept the idea that pitchers should wear helmets. Heck, think of how many years it was before lap belts were mandatory in cars, much less shoulder harnesses! Well said, thought provoking and sad. This comment in reference to Truly S.
My name is Pablo from Chile. I used to play baseball in a small league in Chile until I was 24, and when I was 19 I got hit by a linedrive in a simulated game I was pitching in a practice. I was lucky it only broke my nose in 5 parts and didn’t hit my mouth or eye. We were using aluminium bats. I think it would be very good for pitchers in MLB to start wearing some protection, that way the lower levels and all around the world other pitchers will do it too. Excellent point, Pablo! Sorry you took a hit. This is really sad and interesting. As a young softball player this is some great info to know how to react to a line drive. Yes I agree that pitchers and everyone else on the field. Baseball and softball players need protection from a hard line drive. Reblogged this on Sports Freak. With the technological advances that created bulletproof vests for police officers and kevlar body armor for soldiers (and some sluggers’ elbows), I am surprised we haven’t seen more prototypes of reinforced, protective caps or liners. Maybe more surprising is that we’ve yet to see a police officer who was saved from serious injury by his vest is not advocating the use of similarly designed items for athletes. Reducing risk is a wise process and is the farthest thing from babying a pitcher. Content: I got beaned in the face once by a minor-league pitcher who was coaching my little league team. Mostly my fault, I was catching without a mask not in the game; he just wanted to stretch his arm), and allowed myself to be distracted. The ball skipped off the top of the mitt and into my cheek just below my eye. The ball went up, and I went down. Luckily the park was next door to a hospital, so I knew within minutes that I had a broken orbital (eyesocket) just below my eye and my season (and as it turned out career) was over. Meta: Keith, you blocked me on Twitter. Why? Because I believe there’s cause to strike a balance between the freedom of the press and the safety of people we send into deadly situations to prevent real threats to our freedom of the press? We didn’t even get to the part where applying such a law requires a high standard of legal justification (what Obama does) and not just a political goal (what Nixon and Kissinger did). It’s sad that you’d stomp out of a conversation and a genial relationship that way. This sport has many years offering joys and sorrows to his followers, is why many of us today who follow and support the sport, because every day that passes more technical expertise and interesting plays. … bunch of idiots on this board; anyways: who’s the hottie sitting left a’ Keith’s a’ front row at The Stadium tonight (Friday v. Boston)? Or the chatty blonde to his right? Awesome news about Keith doing postseason baseball on TBS! Too bad they can’t replace dorky Ernie Johnson Jr. with Bob Costas, long-time co-worker of Keith’s. This should be fun– even if David Wells is still on there. In regard to pitchers helmets… Last night my 13 year old son was pitching in a game when a line drive struck him in the side of the head. Fortunately the cat scan came back ok. However a hit a few inches over could have been much more damaging. Seeing my son unable to remember things scared me. He’s no wimp by any means a football player and wrestler as well. With today’s baseball technology of “hot” bats a little league game is a far cry from the days when my dad coached, showed up with an army bag full of wooden bats and balls. If adults choose to not wear pitching helmets, which I think they should, it is one thing but it should certainly be made mandatory in youth and high school leagues. Why wait for a tragedy? Looking online I am unable to find a suitable pitchers helmet. Easton had a design revealed in 2011 but it doesnt seem to be available. I have no political agenda nor do I wish to argue or discuss the matter further. I just wanted to give a dad’s perspective who leaped to his feet and ran to check on his son not knowing what the results would be. Almost 300,000 MLB games played with 1 batter killed by a pitch and 0 pitchers killed by a batted ball. If any pitcher feels concerned it is not against the rules for him to wear a helmet. If he doesn’t want to feel goofy or sweaty let him do as he pleases. All this agita is much ado about nothing. It’s a pitchers nightmare, you’re right in the line of fire. More safety for the game should always be encouraged. I think pitchers need to be taught more on how to release and look for the ball. I remember watching BP at Ohio University (at the time that Mike Schmidt played) and the pitcher refused to use the screen. Yes, a line drive hit him squarely in the side of his head and he dropped to the ground. (No. Mike wasn’t the batter.) I was stunned and ran to the field (I was in med school) but he was gone! That quickly from a stupid decision (or laziness on the part of the team) not to set up the screen. Greg Maddux was simply my favorite pitcher of all time. He won 18 gold gloves! And he was never beaned…Why? When he finished his delivery he was squared up in a crouch facing the batter…ready for any hit ball. The ultimate fifth infielder! So may pitchers just don’t seem to understand that. They end their pitch falling off the mound, facing away from the batter, yada, yada. 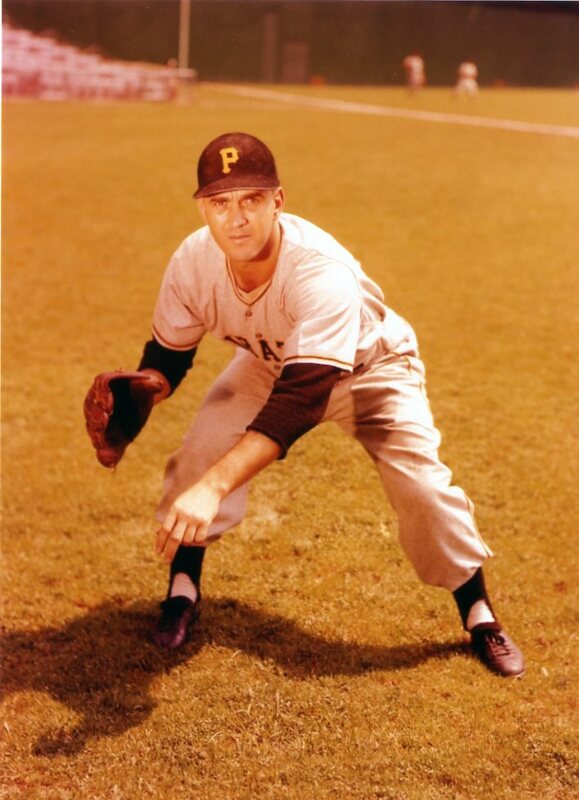 The “professor” was not only the most baseball intelligent pitcher out there but his defense and ability to keep from getting hit in the head should be copied by today’s pitchers. Keith are you going to have a twitter account for your sports content? Being a college pitcher myself, I feel a helmet for the pitcher would be more protective but less comfortable. In the end it is all about the safety of the players but it should be under the discretion of the pitcher. They can make their own decisions. I’m not usually a fan of Keith Olbermann, but here is a blog of his which is definitely worth reading when considering the current debate about pitcher’s helmets in both MLB and scholastic leagues. As a baseball traditionalist, I have often been against many changes as first such as inter-league play, using the all star game for home field advantage and use of instant replay. BUT, the prototypes for pitcher’s headwear are starting to grow on me. If it protects players, it can’t be all that bad. How has everyone forgotten that Hiroki Kuroda was hit in the head by a liner in just 2009? Put a cap on these guys! It is crazy that there is no protection for a pitchers head! those guys are throwing 80-100 mph and getting line drives hit at them! put yourself in that situation, if you are a pitcher and you throw a 90 mph ball, and the batter hits a line drive at your head, wouldn’t you at least want some kind of helmet? This is a very hard question to answer. To me i think that it should depend on if the pitcher wants to. Pitchers should be given the right to decide this. It is a very dangerous position to be on the field considering line shots come right at you. However this is something that could make some pitchers mad if they are forced to wear the helmet. The article will teach you how to mine obsidian in Minecraft easily. you will probably must do it on a desktop computer. him as no one else understand such designated about my trouble. Bob Thorpe was my granduncle. 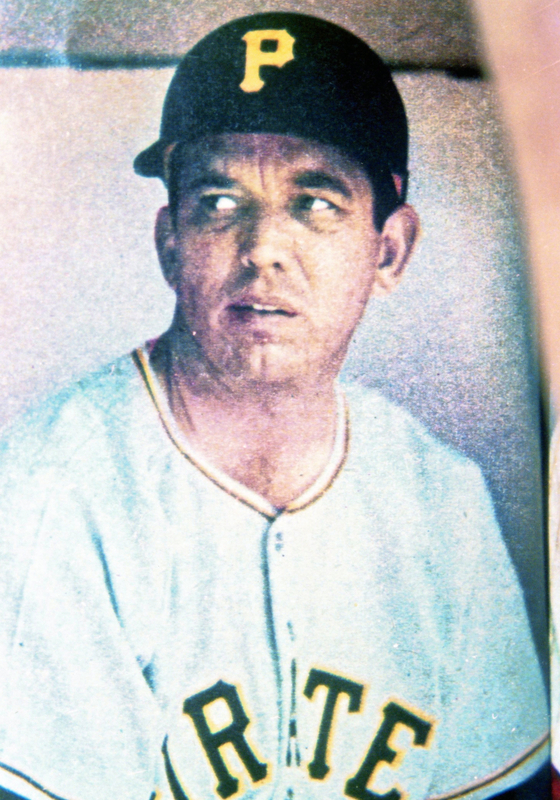 My dad, walter joseph’sandy’ thorpe followed in his favorite uncles’ footsteps, not only in playing baseball, but becoming a master electrician, when his arm also was injured. My uncle bob died on st pattys day , two weeks before his youngest sons, and my birth.i am helping my dad with jis scrapbook, for my grandsons,and have alot of articles on both of them. They should, but will they?! I think not. Even experts, like bet4rate haven’t taken it into consideration. Interesting article. It is alarming to see pitchers get injured by batted balls and pitchers should not remain unprotected from the dangers associated with comebacks to the mound. Whether or not an acceptable helmet/padded hat will be used soon remains to be seen, however, I found it very interesting that it would not be the first time pitchers used helmets. 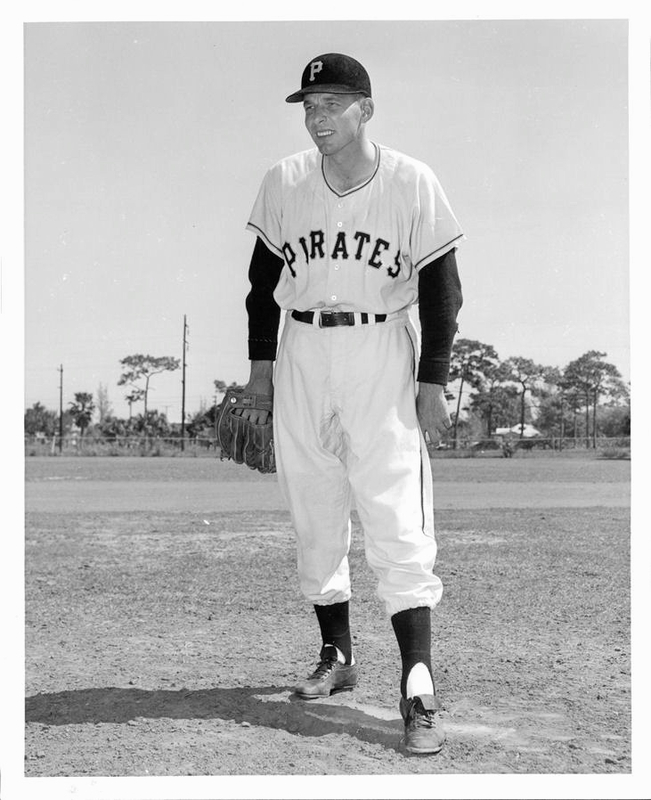 I was unaware of the history with the Pirates player wearing helmets until I read this article. To boost head security, pitchers ought to for sure wear protective caps. However, baseball’s medicinal executive, Dr. Gary Green a doctor and educator of games solution at UCLA doesn’t see caps happening.